This walk: 2013-8-21. Footbridges, West Okement River, Meldon Dam, Meldon Pool, limestone quarry, lime kilns, ragwort, Meldon Viaduct, finger dumps, wheel pit, Meldon Reservoir. Bing and Google maps side by side - but no GPS track. Simple view ahead near the start of the walk. The first bridge at about SX 56427 92081, over the West Okement River below Meldon Dam (not crossed on the out-walk but on the return walk). Meldon Pool, an old limestone quarry, now flooded. This was a special Carbonifereous period limestone, not found anywhere else on Dartmoor; laid down 350 million years ago by living coral reefs. The rock was treated in nearby lime kilns with alternate layers of limestone and charcoal, which was lit at the bottom and burned at high temperature for three days. Used for treating fields and soils in farming to "sweeten" the land. The pool is deeper than the nearby Meldon Viaduct is high: the pool is around 40 metres (130 feet), the tallest viaduct span is 120 feet. Click the image to see a larger version. View across Meldon Pool. Early in the Carboniferous Period, around 350 million years ago, the Variscan Orogeny occurred, when the African tectonic plate collided with the European plate. This climaxed with the intrusion of the molten magma of the Dartmoor granite. Oceanic sediments were pushed up, folded and baked with the tremendous heat of the process. The rocks around the granite were changed and are referred to as the metamorphic aureole - Meldon is entirely within this region. Super-heated fluids leaked from the granite into the metamorphosed rocks of the surrounding country rock to form new minerals. Source: "Exploring a Dartmoor Valley", Peter Keene, DNPA & Devon County Council, 2007. The surface exposure of dark limestone sandwiched between layers of hard flinty chert. View from the end of the lake. The ruins of a building associated with a weighbridge that is almost hidden nearby, for weighing cartloads of lime from the nearby kiln. The west lime kiln ..... built 1880-1885, charcoal was made here from the surrounding woodlands as well until the train came with cheaper fuel, coal. The limestone was roasted in alternate layers using charcoal to convert it fom calcium carbonate into quicklime, calcium oxide. This would be slaked with water and then powdered to form slaked lime (calcium hydroxide) to put on land to raise the pH and increase its fertility. The stone and charcoal were lifted to a loading platform at the top of the kiln using an inclined tramway. The charge was lit through the grate at the back of the kiln and after three days, the lime was shovelled out through the same grate into waiting carts. The limekiln was disused by 1905. Source: "Exploring a Dartmoor Valley", Peter Keene, DNPA & Devon County Council, 2007, page 17. Meldon Viaduct and a more modern description. A second footbridge close to SX 56470 92731. View from below Meldon Viaduct - I ask you, who would want such a view, would-be climbers? The London & South Western Railway Co. from Exeter reached Okehampton in 1871. It was extended as a single track as far as Lydford in 1874 and this involved building the viaduct, spanning the river for 165 metres. The original viaduct was built of wrought iron and it was riveted. The line was extended to Plymouth and the track was doubled in 1878, with a second viaduct being made of welded mild steel. The viaduct is a Scheduled Ancient Monument. Lime kiln east, built 1790. The earliest building in the valley to exploit the local geology. The view is partially blocked by an inclined tramway that took quarried stone up to the railway viaduct (which was built in 1874). There were two waterwheels in this area to drain the quarry, this is the pit of one of them beside the modern footbridge, the wheel here was about 5.5 metres in diameter and was of a "pitch back" design, which means that the water delivered to the top of the wheel did not overshoot it but caused it to run backwards ..... Some 30 metres upstream from the footbridge is another wheel-pit that housed a larger wheel, perhaps 7 metres in diameter, to distribute power by a flat-rod system. An adit seen along the way: there is something interesting draining from it! Had to lean out quite a long way to get this view! View of the valley below the dam. Meldon Reservoir, 42 metres (137 feet) deep when full. 6th Anniversary Cake, with the usual embarrassments to Miss! 2nd - 2009, at Pat & Peter's house - horrible wet day, no photos - had to be 19 or 28 Aug, no walks for those dates. 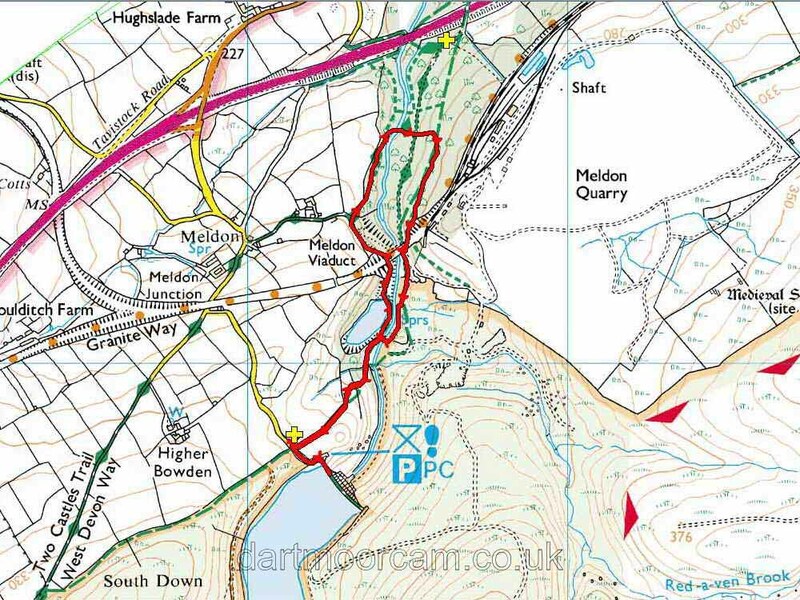 This walk was reached by turning off the A30 approaching Okehampton from the west, and following the signs to "Meldon" and "Reservoir Car Park". The park is at the yellow cross symbol on the map above. The placement of the Ordnance Survey parking symbol etc. on the map is incorrect. Distance - 3.22 km / 2.00 miles.